Beautiful Lakota Chex daughter who will eat from your hand. We're retaining both her 2015 daughter (r3 Fire Princess) and her 2017 daughter (r3 Fire Dancer) as her replacements. Beautiful cow. Over 70" t2t, with a whole bunch of total horn! Not a pet, but easy to work. She doesn't have the best calving interval based on year round exposure to a bull. She would probably do better in a program with a scheduled breeding season/calving season. Grandizm is a big, brindle son of WS Jamakizm. He has a great temperament (he'll eat from your hand), he's easy to work and he stays at home. 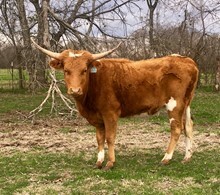 He's sired some flashy heifers for us and we're excited about his third calf crop arriving this spring..
A sweet, flashy, well-bred heifer. 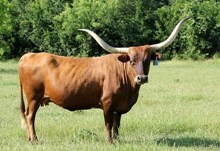 She will be a beautiful longhorn cow but her horns aren't growing fast enough for our program. 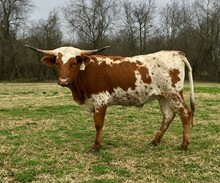 NIce Grandizm daughter, blood tested bred to Brazos Don Juan 661. Her horns are growing a bit slow for our program, but they'll have a nice roll to them when she gets older. FLASHY FLASHY FLASHY! 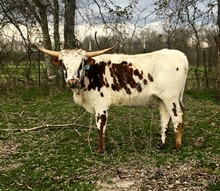 This is a beautiful, front pasture cow in the making. 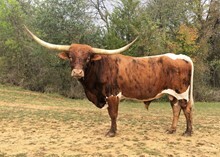 Her horns are a bit asymmetrical (which may be hard to see in the picture) but she is absolutely gorgeous.